The next change is performed. This morning I have changed my Fedora system from Fedora 27 to 28, because Fedora 27 has reached EOL (End of Life). EOL means, there are no new updates and updates are very important. Fortunately I’m not a Windows user who always clutches to his operating system (for example Windows XP). Only people from the IT knows the importance of updates. In my work in the IT helpdesk every big update, every times where it takes a few minutes, the user is irritated and says: „Why must this update comes now?“. Ok, sometimes it is very bizarre when Windows does an update. But it would not do it, I think we would have a lot of not updated operating systems in companies. Even the new look of Gnome (from the 2 series to 3 series was not the end of the world for me). I do the change of the version number in Fedora on a time where I have the most time. Two days without a new update of a distribution is not the end of the world, too. But you never do it longer than a week when you know there won’t be new updates. I do it in the command line because it is much easier than the graphical environment. You only need three orders. That’s all. The most of the time you must wait. I have waited 2 hours and 15 minutes. 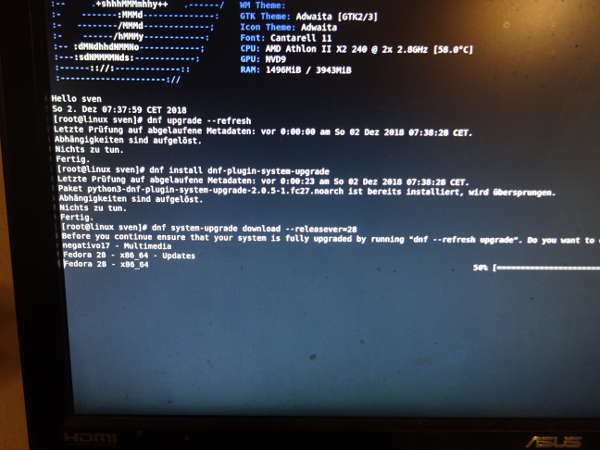 Even if you see the old kernel of your previous operating system, you must boot the latest kernel and after this the new package were installed. This process could take a long time (at least 45 to 60 minutes) and you only see one row and Fedora logo that at the beginning grey and should have in the end the normal colour. The system does a normal routine of upgrading. That means in Fedora that it installs the new packages, removes then the old one and checks the new one. That this there is reboot of the system to the log in prompt to your display manager. I use Gnome 3 and in my case it is the Gdm display manager. I still use Xorg. I wait until Wayland just as well. In Fedora 25 or 26 it had looked harrowing because a lot of programs did not the normal icons in it. 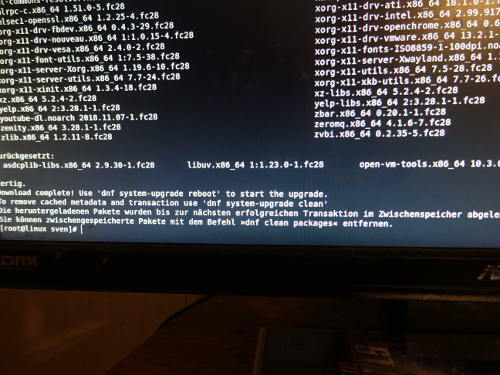 Dieser Beitrag wurde unter English, Linux abgelegt und mit Backup, EOL, Fedora, Fedora_28, Gdm, Gnome, wayland, Xorg verschlagwortet. Setze ein Lesezeichen auf den Permalink. I check every commentary here before I will publish it. spam remarks? If so how do you гeduce it, any plugin or anything you can recommend? I get so much lately it’s driving me maԀ so any help iіs vey mսch apprеciated.